Moose Gear, the leading brand of kids apparel in the country has prepared an enjoyable and at the same time a beneficial activity for our kids this summer. The event entitled "Moose Playcamp". Moose Gear will also launch their summer collection, covering a wide range of styles suitable for different occasions and themes. To name a few - athleisure, sporty look and streetwear collection. 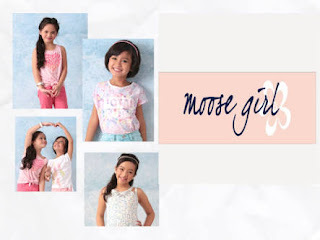 This will surely prove that Moose Gear is still the number 1 brand when it comes to dressing and styling our little ones. 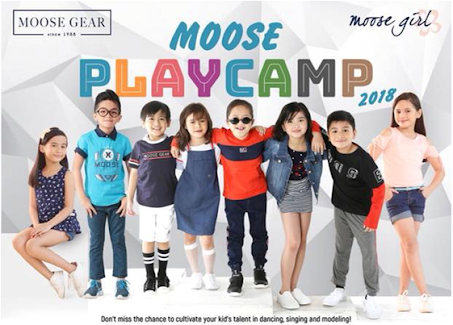 Meanwhile, Moose Playcamp will be a combination of meet and greet activity where their celebrity endorsers get to meet with our kids. 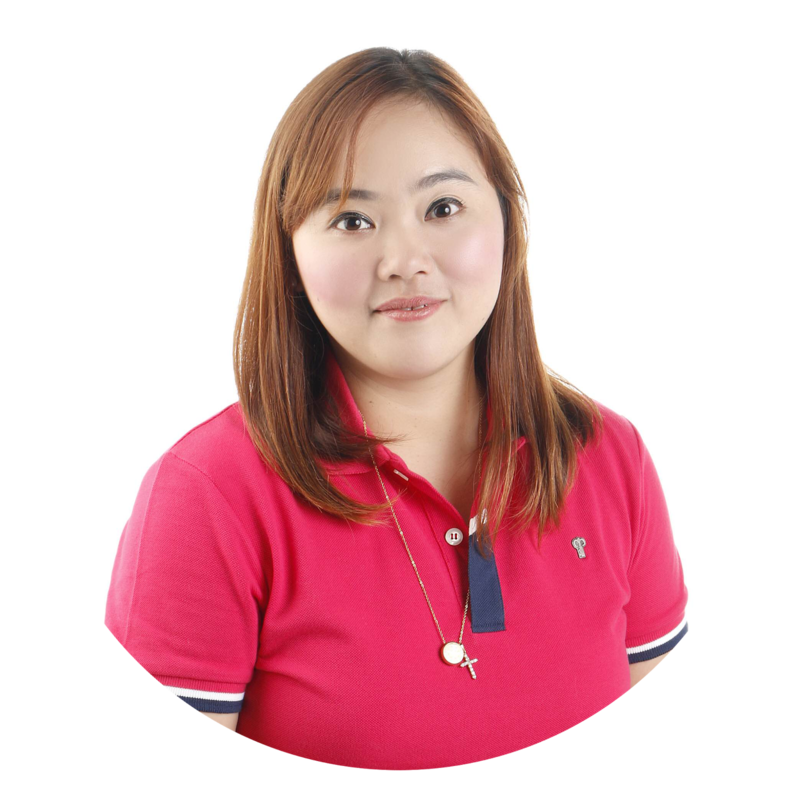 The event is geared towards a fun, inspirational and entertaining experience for our kids. 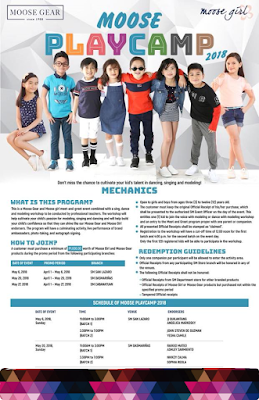 The Moose Playcamp is also essentially an opportunity for your kids to attend a talent workshop in singing, dancing and modelling - conducted by professional teachers. picture-taking opportunities and autograph signing. A minimum of P1,000 worth of Moose Gear or Moose Girl product purchased during the promo period in the participating branches, entitles your (1) kid to the Play Camp. 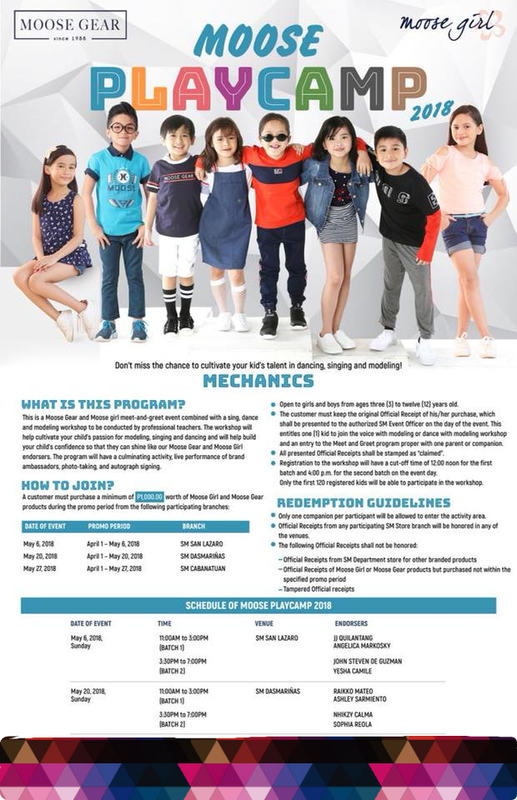 Just remember, though, that your purchase-receipt SHOULD be within the promo period of the SM branches that will be holding the Moose Play Camp. Check the list below and mark the dates. to make sure that everyone gets a chance to attend the Moose Play Camp. Check attached poster for more exciting details moms!